Linder is an experienced and skilled sculptor and in Blindsided her approach is simple and straightforward. 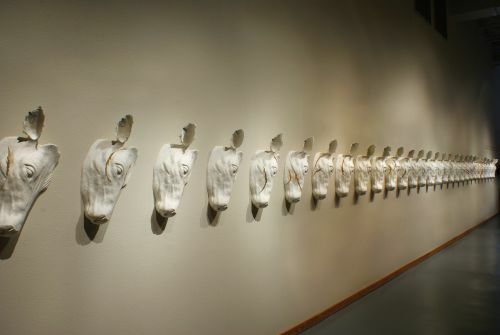 Her decision to present an apparently sterile duplication of 100 identical cow heads speaks to us of identity lost. Linder confronts us with one white head after another revealing a darker reality: the underlying desire to create a uniform, streamlined, and inexpensive production line. Linder has exhibited extensively in the region. She has an MFA from the University of Colorado in Boulder and an MA from Eastern Illinois University in Charleston. Her artwork is present in numerous public collections throughout the region including Montana State University, Yellowstone Art Museum, and Paris Gibson Square Museum of Art.